Mercury enters Gemini today, and while Mercury typically spends less than a month in a sign, an upcoming retrograde in the sign will extend this period, and Mercury will be in Gemini all the way up until July 8th. The Moon is in Virgo until 10:02 AM. The Moon is void from 8:23 AM to 10:02 AM. The Moon is in Libra from 10:02 AM forward (until Saturday, May 2nd, at 9:47 PM). The Moon is waxing, and is in its Waxing Gibbous phase. 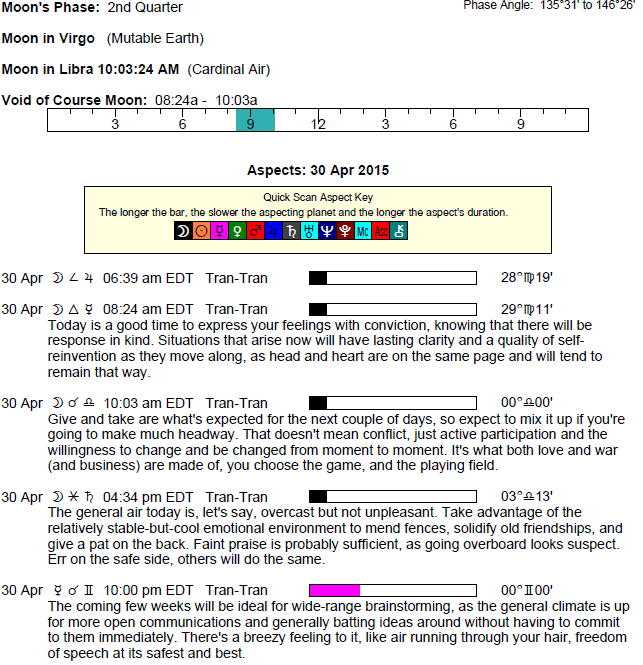 Mercury enters Gemini – Mercury will transit Gemini from April 30-July 8. Venus is already moving through your communications sector, dear Aries, and today, Mercury enters this same area of your solar chart. Mercury is spending more time than usual here, suggesting there is much to learn, and with an upcoming Mercury retrograde cycle, perhaps a lot to relearn as well. You are drawn to personal mental interests, studies, communications, reaching out to others, making connections, and short trips, or these things simply come into stronger focus now. At times, this can make you a little nervous or fidgety, as it can be difficult to concentrate with so much distracting you and a lot of busy work to get done, but if this added activity is mostly pleasant, it can help you feel more engaged and less stressed, depending on your nature. Today, the Moon moves into the sign opposite yours, and your emotional focus tends to be on what you’re missing to feel complete. You are more emotionally geared towards taking care of business today, Taurus, with the Moon moving into your solar sixth house and turning your attention to the details of your daily life. You’re also becoming more concerned about your responsibilities, work, and health. Mercury leaves your sign today and enters Gemini, where it will stay until July 8th, and influencing your solar second house. There can be strong focus on your resources, money, valuables, possessions, skills, talents, and practical affairs during this period, although at times, there can be quite a bit of worry and possibly misunderstandings about these things. This can be a strong period for thinking up new money-making ideas, and your conversations tend to be more practical than fanciful. The Moon entering fellow Air sign Libra this morning comes in like a nice breeze, dear Gemini. It becomes easier to express yourself and to feel in sync with people around you. Mercury enters your sign today, where it will transit for an extended stay, until July 8th. You have your voice back! Not that you lost it, but you are now a little more willing to talk about yourself and your personal plans, and decision-making is sharper, although later in the cycle, Mercury will turn retrograde and could slow down that process temporarily. This is a cycle in which you tend to talk more readily, particularly about your own personal likes and dislikes or about your past. You make more executive decisions, but others turn to you for advice more often, as people are seeing your rational side more clearly. You tend to attract what you want through the power of words at this time. 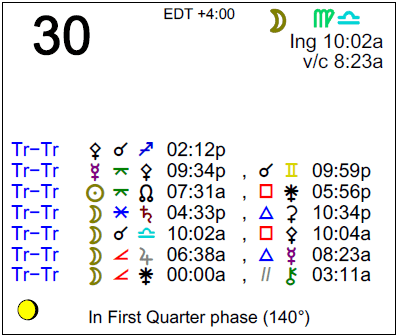 Mercury begins influencing your solar twelfth house today, Cancer, where it will transit until July 8th. Your mind is focused on private matters and past issues, and you are searching for meaning in different or hidden places. Mercury can be analytical, making this a good time to examine these things, but it’s also mental and detached. This is a good time for research and quiet contemplation. Decision-making tends to take more time as a result of all of this. This is an especially strong cycle for working on finalizing projects or studies. Today, you begin to seek out some quiet time with the Moon moving into your home and family sector. Until July 8th, Mercury is influencing your solar eleventh house, Leo. This is a time when conversations with friends and various networking activities increase and stand to offer real learning experiences. You are especially attracted to conversing with people who are like-minded, with peers, and networking. When it comes to networking, you can learn a lot through others, but can also enjoy sharing your own ideas or expertise with friends and associates. Your thinking is a little more progressive, and possibly avant-garde or unconventional. It’s a great time for dreaming up new ideas, plans, and possible solutions, even if only some of them will take seed. The Moon enters your communications sector today, increasing your curiosity and desire to reach out. This is a good time for collaboration. Even so, you can benefit today and tomorrow doing research or working passionately on projects and ideas. From today until July 8th, Mercury is influencing your solar tenth house, Virgo. This is a good time for gathering information and boosting your knowledge that will help your career or social prospects. It’s also a time when you could be given more decision-making responsibility, or you could be thinking a lot about your life path and career goals. Whether you’re doing career planning or simply thinking in more concrete, practical terms, it’s a time for getting your thoughts into order and establishing priorities. Watch for losing yourself in details during this period, however. The Moon moves into your resources and worth sector, further turning your attention to the practical side of your life. Today is also good for collaborating with others, and especially a partner. The Moon leaves your relatively anonymous solar twelfth house and enters your sign this morning, Libra, bringing a nice feeling of emergence or beginning anew. Emotional needs are now loud and clear. If you need to pour your heart and soul into an important project, it’s a good time to do so. Mercury enters your solar ninth house today, coming into harmony with your sign. This transit lasts a little longer than most Mercury cycles, until July 8th. Educational or philosophical subjects could be more interesting or relevant to you now. Practical considerations take a back seat to moral ones when you’re making decisions during this cycle, and there is more enthusiasm and optimism in your communications. The Moon moves into your solar twelfth house this morning, Scorpio, which is the final sector of the chart and points to a brief monthly two-day period for seeking closure and emotional quiet or renewal. You may need to disengage from the more demanding areas of your life just enough to give yourself time to recoup. Mercury enters your solar eighth house today, where it will transit until July 8th. This brings a less publicly communicative period when you’re far more interested in subtleties and hidden or mysterious aspects of your life than the more routine elements. Besides intimate and psychological matters, you can also be thinking about or analyzing debts, finances, and taxes. Your ruler, Pluto, in supportive aspect to Vesta increases your common sense and fuels your passion for a particular project. It’s a great time for making a commitment or dedicating yourself to a pet project. The Moon’s move into your solar eleventh house and into harmony with your sign this morning can be a pleasing one for your mood, Sagittarius. Pressure to perform and a feeling of being under a microscope fall away, and you tend to feel more at ease. Mercury’s move into Gemini today is another sociable influence, but one that will last far longer, until July 8th. You are inclined to seek out others, or they tend to seek you out, for conversation, input, and ideas. You could find yourself more frequently in the position to negotiate and collaborate. You tend to be attracted to, or you attract, people who love to talk, who are restless or encourage activity, or who stimulate your curiosity. Mercury moves into your work and health sector today, Capricorn, and while this planet of communication moves out of a position of harmony with your sign, it’s a fairly good place for it to visit. It’s a good cycle, lasting until July 8th, for sorting out the details of your daily life, for researching and gathering information about work and health methods, for updating skills, and for reorganizing your life in small but important ways. When Mercury is in poor shape, beleaguered by other planets for example, during this period. you could be inclined to fret and worry about the little things. The Moon moves into harmony with your sign and your adventure sector this morning, Aquarius, stimulating a nice feeling of freedom in the form of emotional release from pressure. Mercury also moves into harmony with your sign today, but for a far longer stay, until July 8th. This is a playful, expressive period when you are prouder than usual of your ideas, and others are responding well to them and to you. Your thinking is more creative and your mode of expression more entertaining. Areas of life associated with the fifth house where Mercury is now transiting can be more interesting or relevant to you now, including romance, children, and hobbies or creative pursuits. This can be a time for standing out from the crowd on a mental level. Mercury enters Gemini today and will stay in the sign longer than usual, until July 8th, due to an upcoming retrograde cycle, Pisces. With Mercury influencing your solar fourth house, your thoughts and conversations tend to more frequently revolve around personal matters, especially family, home, and domestic issues. You can draw upon more rationality and logic when it comes to your relationship with family and your domestic world, making it a little easier to make good choices and decisions, although some of these things can require second thoughts or adjustments later. However, you could be quite sensitive when it comes to communications outside of your personal life. Just for now, career and more worldly matters are not quite as interesting to you as personal affairs. Sometimes this points to a particularly busy home life, or working from home. If Your Birthday is April 30th, If Today is Your Birthday full horoscope here. We could have a hard time juggling our personal goals and others’ needs, feeling as if we must choose one or the other. Sabian Symbol: A red cross nurse. Cnj 22°Ge22 PHACT Adventure, good fortune. Cnj 21°Ge09 BELLATRIX ** Success through the Shadow. Moon 06° Capricorn 09' 22"